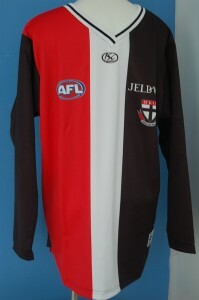 25 % off sale , on most items , in ebay store Football Fashions , starting 23 July until 31 July , 2011. Discounted jumpers , jerseys , guernseys , include AFL Teams Brisbane Lions , Port Adelaide Power , West Coast Eagles , St Kilda Saints , Sydney Swans and Melbourne Demons . This entry was posted on Saturday, July 23rd, 2011 at 3:41 pm	and is filed under AFL, football jumpers, NRL. You can follow any responses to this entry through the RSS 2.0 feed. Both comments and pings are currently closed.